Paypal or Money Order, No trades, No Offers .... Continental USA and Hawaii only ... Thanks! Already boxed up securely and ready to ship out. Up for sale is (1) very clean used Schwinn Stamped Bottom Bracket in 28 thread. Came off an early 80's Schwinn Sidewinder, not sure if it was stock or not. This set looks complete minus the large washer for the driveside race. There is wear on the cups/bearings/races but nothing extreme. Slight pitting, only see one very small spot where there is missing metal on one cone. Schwinn Bearings are both stamped 6178A , not sure if they are original. I'm guessing that this American BB might fit a Redline 401 spindle, maybe not. Threads are not perfect but do thread on fine, lock nut is not stripped. 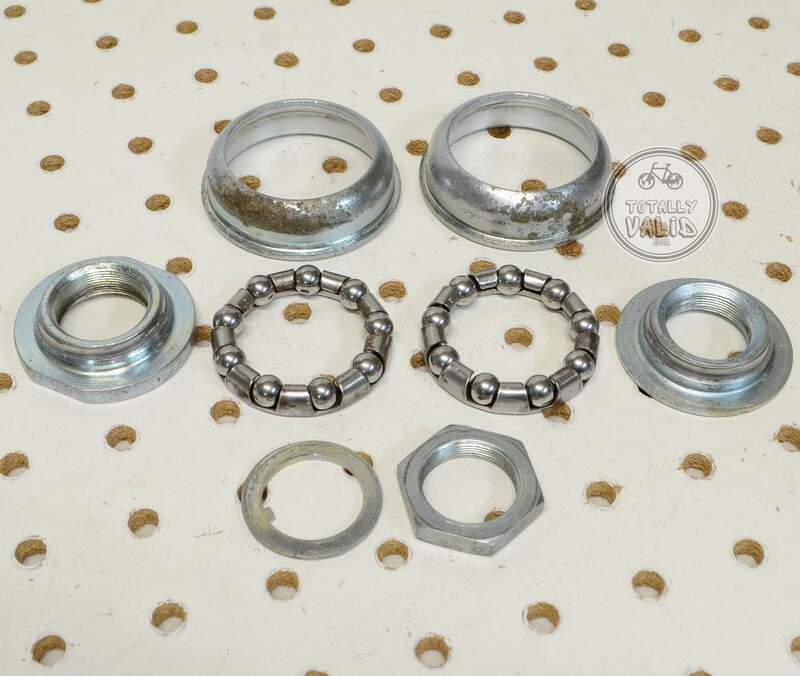 Buyer gets the exact Bottom bracket in picture #1, in exact condition. Every part in picture #1 is included, nothing more and nothing less. Please expect scratches/nicks/wear/weathering/oxidation/missing washer/rust/pitting/etc, not perfect. USPS First Class mail w/ tracking. Shipping available to the Continental USA or Hawaii only. Please, no APO's and no Puerto Rico.